"The stories of great high school funk bands are, thanks to an abundance of reissues, commonplace. The tales of great high school soul-bands are still rare. A ballad or two on the random Douglass High School Stage Band album or Timeless Legend’s mesmerizing entry on Columbus’s 1972 1st Annual Inner City Talent Expo notwithstanding, high school bands rarely struck into the realm of “grown folks” music. 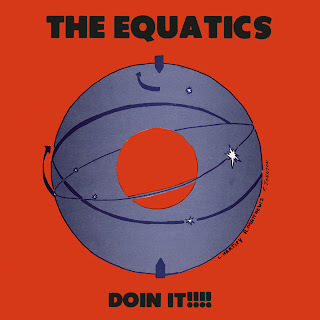 Enter The Equatics and their brooding masterpiece Doin’ It!!!! If this is categorized as a “funk” album – and it was for the last ten years, by those few lucky enough to own an original copy – it holds its own. But it was as a soul band – one as inspired by the melancholic musings of Bill Withers as the psychedelic-pop of the self-proclaimed “Black Moses,” Issac Hayes – that the Equatics shone. These young souls offered world-weary, beat-heavy ballads that stand on par with any of the great independent organizations of the early 1970s. That a group of teenagers could offer such an angst-ridden plea as that of Leo Davis’s “Merry Go Round” not only transcends the limitations that came from the band’s average age (seventeen, at the time of the album’s recording), but also the barriers the stood in front of this group of small-city hopefuls." Never heard of these guys. Thanx!